Yard waste carts will no longer require a sticker for service. 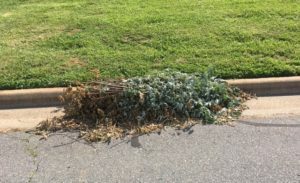 If you do not currently have a yard waste cart, one can be purchased from the Public Services Department for $60. For those who have 2nd gray trash carts, the stickers for those WILL STILL BE REQUIRED FOR PICK-UP and can be purchased from the Public Services Department for $60. *Hand Pile – This will fit into a yard waste container, and therefore, will not be picked up on the curb. Boom Pile – This will still be picked up on the curb.